A handful of individuals and their organizations have persevered to develop pathways for cost-effective solar energy in Virginia, a state where utilities are widely viewed to be undermining the adoption of solar by their customers. One of the more creative is Anthony “Tony” Smith, founder of Secure Futures, LLC, a solar developer nestled in Virginia’s Blue Ridge Mountains and an associate professor of business and economics at Eastern Mennonite University in nearby Harrisonburg. Smith was weighing whether solar energy could have any future in the Commonwealth when he got a call in 2009 from a professor at James Madison University just north of him off of Interstate 81 urging him to join in a business plan competition at the University. Smith didn’t win the competition but it proved to be the inspiration for one of the few ways that solar energy can work at least for tax-exempt organizations in Virginia: a version of a power purchase agreement, or PPA. Power purchase agreements were getting traction in many states through the mid-2000s. Under a traditional PPA, the solar developer designs, permits, finances, installs and owns a solar system at its cost, not the customer’s. The developer sells the power to the customer at a rate typically lower than the local utility’s rate and banks the income from the sales along with any tax credits and other incentives the system qualifies for. One incentive is the option, where allowed, to sell excess electricity back to the grid under “net metering” policies. One problem with this traditional model for Smith: it wouldn’t work in Virginia. Yet his interpretation of state law did, technically, permit PPAs. Because EMU bought its electricity a municipal utility serving the town of Harrisonburg, Smith saw an opportunity. With EMU’s cooperation and its stated commitment to sustainability, the University could own a solar system to supply a portion of its own power while reducing carbon emissions in the community. It could walk the talk of sustainability. But Smith was getting ahead of himself. At one point, the Harrisonburg Electric Commission’s top brass thought it would make up for the loss in revenue from EMU by raising rates that it would charge the university. It also considered crediting EMU with any electricity supplied back to its grid at the wholesale power rate, not the higher retail rate the customers paid, leading to some edgy negotiations. The 104-kilowatt deal — the largest solar energy system in Virginia at the time — was signed with net metering at the retail rate, the first of its kind in Harrisonburg. “Tony’s playing an important role in the expansion of the solar industry in Virginia,” said Cale Jaffe, Director of the Virginia Office of the Southern Environmental Law Center. About 60 miles south of Harrisonburg off I-81, leaders at Washington & Lee University (W&L) in Lexington took notice and embarked with Secure Futures on a similar transaction in 2011. With funds from the federal American Relief and Recovery Act grant paving the way, it was smooth sailing though about the midway point of construction in September 2011 when Washington & Lee and Secure Futures received a cease-and-desist order from Dominion Virginia Power, W&L’s electric utility. Dominion asserted it violated its rights as the monopoly electric utility serving Lexington. With one attorney at his side, Smith sought legal relief at the State Corporation Commission (SCC). But he couldn’t quickly win the required authorization to proceed. Smith said he was “outflanked” by – count ’em – 11 attorneys from Dominion before a regulatory body that is widely viewed to be very accommodating to Dominion. Smith pressed on. So Dominion sent him a second cease-and-desist order, making it clear it would do what ever it takes to stop him. Perhaps Dominion’s top brass figured if it lost this battle, it could pave the way for similar deals. And that could nominally eat into its profits and perhaps the perceived value of the parent company’s stock; this despite being a monopoly utility serving two-thirds of all electricity users in Virginia. To prevail, Smith would have to fight it all the way to the state Supreme Court, which had political leanings of its own. Even so, such a battle would have taken the project beyond the system’s December 31, 2012 completion date. So Smith pivoted and turned the PPA into a 20-year equipment lease to keep some sort of a deal alive. And it worked. 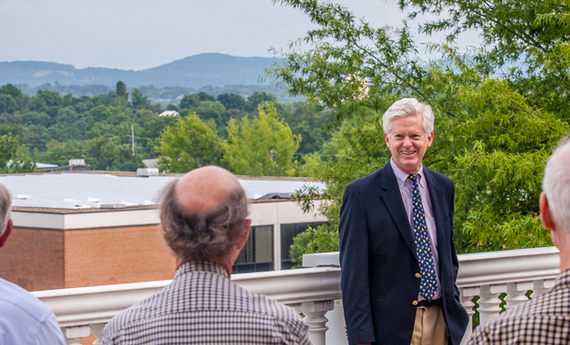 What became a 444 kilowatt system at W&L was far less profitable for Secure Futures because it could not deduct depreciation on an accelerated basis. But it set a noteworthy example for policymakers to learn from. In the eyes of many clean energy advocates, it helped focus attention on Dominion’s behavior, its influence elected officials throughout the Commonwealth and its unwillingness to enable an open market for solar energy in Virginia. David Botkins, a spokesman for Dominion, declined to comment on Smith’s ventures. Not to be out done, Smith pivoted again, this time to craft a template for customers to generate their own power with a system financed, built, owned, operated and maintained by Secure Futures for a fee while guaranteeing the system’s performance, not its power output. Smith wanted to test this model and found the tiny First United Church of Christ – just down the highway from Dominion’s largest power plant, in Chesterfield, Virginia — to acquire a small, 3.5 kilowatt, system to generate about 10% of its power. The transaction, dubbed a “solar customer self-generation agreement,” allowed the church to go solar with no money down. “What the customer self-generation agreement does is send a signal to people who want to find a way to go solar and who won’t stand for Dominion’s delaying tactics,” said Main. Efforts to engage Dominion, meanwhile, on PPA legislation that it could live with leading up to the 2013 Virginia General Assembly barely got started before Dominion all but slammed the door on negotiations. Dominion eventually agreed to legislation that was signed into law by then-Gov. Bob McDonnell and authored principally by Sen. John Edwards, a Democrat from Roanoke, to allow a pilot program totaling up to 50 megawatts throughout Dominion’s vast service territory. In the roughly 18 months that followed, Dominion embarked on solar systems totaling a mere 2.7 megawatts, including its largest single system to date – 750 kilowatts – that went live in early July in Sterling, Virginia. Compare Virginia Power’s track record to the investor-owned utility in neighboring North Carolina. There, Duke Energy, the nation’s largest electricity utility, thus far has deployed about 100 megawatts of solar. Further south, Georgia Power has installed 168 MWs of solar throughout the Peach State. A law that went into effect July 1 in Georgia empowers third parties to sell solar systems to end-users there. No such law is given any chance of being seriously considered in Virginia due largely to Dominion’s influence on the governorship and both parties in the state’s General Assembly. The efforts by Tony Smith and other solar developers in Virginia might change that by proving solar’s value to consumers and to the state’s economy, which is smarting from cutbacks in defense spending. Botkins, the Dominion spokesman, asserts now it is “all over solar” with a pledge to develop up to 400 MWs by 2020. Smith is applying the model established for the church in Chesterfield for public school districts in Virginia to walk the talk about cleaner energy. Under its Solar Schools Initiative, a school buys the power off the panels and leases its roof space while Secure Futures buys, installs, maintains, and owns the panels. 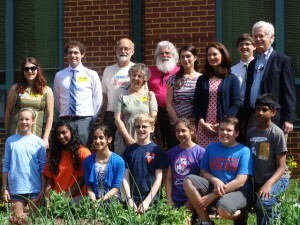 The public school district that serves Albemarle County became the first public school district in Virginia to go solar under one of these agreements earning accolades from Virginia Gov. Terry McAuliffe. A full megawatt of solar panels on six schools throughout Charlottesville and the surrounding area is expected to meet about 6% of the entire district’s annual electricity requirements. The next power pivot by Smith may be unveiled soon. Smith shared with The Energy Fix a partnership to be announced for financing solar projects with a large corporation that he said shares his triple bottom line values.